About: Born in Singapore, and having traveled throughout Asia, Chef Mohan Ismail strives to bring authentic Southeast Asian flavors to the people of Los Angeles. 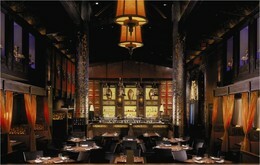 The RockSugar Pan Asian Kitchen menu features cuisines from all over the region gathered together in one place. Indian flatbreads, Thai noodles, and Chinese fried rice all co-exist in harmony at RockSugar. Chef Ismail selected his Lemongrass Shrimp Cakes with Sweet Chili for you to try at home. 1. Heat 2 tbsp. of oil in a teflon pan over medium high heat to a light sizzle. 2. Make a 2 oz. patty from the shrimp base and repeat until all the base has been used. 3. You will get 12 pieces of the cakes from each batch. 5. Flip the cake onto the other side and cook until golden and cooked through. 6. Remove the cooked shrimp cakes form the pan and drain on paper towel. 1. Take 8 oz of the shrimp and process to a paste in a food processor. 2. Finely mince the other 8 oz by hand and mix the shrimp together. 3. Transfer to a mixing bowl and set aside in the refrigerator. 4. Finely mince the lemongrass and set aside. 5. Blanch the green beans quickly in boiling hot water. 6. Remove and shock in iced water, drain and set aside. 7. Add the green onions, cilantro, Thai basil, red jalapeno, kafir lime leaves, green beans, lemongrass into the shrimp mixture. 8. Add the salt, sesame oil and white pepper to the mix and fold gently to incorporate. 1. Place sweet chili sauce, lime juice, rice vinegar and fish sauce into a mixing bowl. 2. Whisk until all ingredients are thoroughly blended. 3. Transfer into a storage container.